Window replacement can be more straightforward if you know which features to look for. Aside from a durable framing material, you should also consider the glass package that your new units have. Make sure that it can help maintain your home’s energy efficiency. Fortunately, looking for this advanced glass is easier than you think. Just turn to Kroll Construction, one of the leading window companies in Michigan. We offer only Alside replacement windows, which come with cutting-edge ClimaTech glass. When you go for this option, you can benefit from considerable energy savings all year round. 1. Low-E Insulating Glass—Alside’s optional ClimaTech package combines multi-layered low-emissive (Low-E) glass and argon gas. Together, they repel radiant heat and protect your interior from sun damage in summer. They can also let in solar heat and hold warm energy inside your home during winter. 2. Intercept® Warm-Edge Spacer System—This comes with a distinctive, one-piece metal alloy and U-channel design, creating a great thermal barrier that reduces heat loss through the window. Intercept’s design makes the spacers more durable and effective in retaining insulating glass. In fact, these spacers are so energy-efficient that they can keep your home more comfortable in colder months. They make this happen by holding the warmth at the edges of your Alside replacement windows in Michigan. 3. Insulating Argon Gas—The ClimaTech system also uses argon gas. The spacers hold this odorless, non-toxic gas in place between the window glasses, boosting the unit’s energy efficiency. In addition, it serves as an effective sound barrier, helping you keep a quieter home. According to studies by the U.S. Department of Energy, old and failing windows can cause up to 30% of your home’s energy loss. When you turn to Kroll Construction for your window replacement in Michigan, this will no longer be an issue. 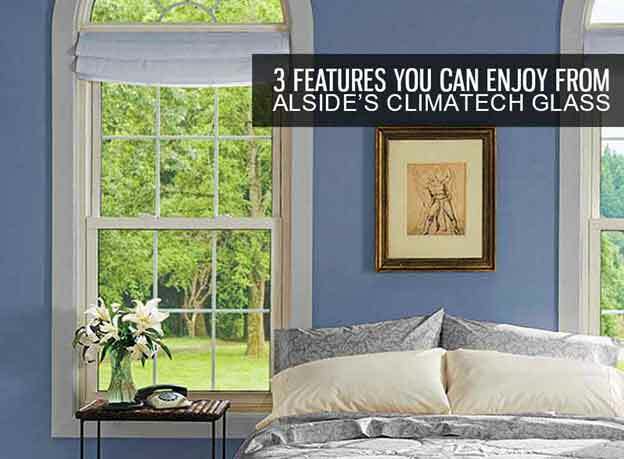 The energy-saving features of ClimaTech glass package from Alside can help you maintain a more thermally comfortable home, minus the high energy bills. Call us at (888) 338-6340 or fill out our form today for a free estimate.